Jianshi--Earliest Extra-African Hominin, Further Evidence of Late Occurring Lufengpithecus or Fossil Orangutan? Liu et al. (2010) have recently published a study of three supposedly hominin teeth from the Longgudong cave site in Jianshi county, Hubei. The teeth augment the sample of 4 hominin-like teeth collected in and around Jianshi in the 1970s that were initially attributed to an australopithecine (Gao 1975). The assessment by Liu et al. (2010) supplements the report in the 2004 monograph on Jianshi (Zheng 2004) published as the first in a series commissioned as part of the State Key Project of the 9th Five Year Plan – Origin of Early Humans and Environmental Background. The 2004 monograph is a comprehensive study of the geology, stratigraphy and paleontology of the fossil bearing site. In it the three hominin-like teeth, collected in 2000, were assigned to the Javanese genus and species Meganthropus paleojavanicus, based primarily on metric criteria. The Jianshi site is further distinguished by the presence of a relatively large number of Gigantopithecus blacki teeth (28 in toto) and an extensive and diagnostic mammalian fauna. Study of the micro- and macro-mammalian fossils indicates a biochronological age slightly younger than the Longgupo site at Wushan, Chongqing (former Sichuan) or the Gigantopithecus cave site at Liucheng, Guangxi. Paleomagnetic research, however, suggests that the hominin-like material falls below the Reunion Normal Polarity Event or in excess of 2.15 mya. As such the Jianshi specimens would represent the earliest record of an extra-African human presence in all of Eurasia. Unfortunately only the holotype specimen, a lower M2, is figured. In its overall appearance it looks remarkably similar to M2’s from Lufeng and is analogous in features to the M1 from Longgupo. Its description and analysis is also consistent with previously known Lufengpithecus. The two recently described molars from Jianshi, one upper and one lower, are extremely well worn and lack most diagnostic surface features. They, as well as the original set of four molars described from Jianshi, are relatively large but fall within the upper range of variation of the Lufeng sample of hominoid molars. In this regard the Longgupo specimen falls within the lower range of variation. Therefore in terms of dental metrics there is no reason to dismiss the Jianshi and Longgupo remains as potentially members of a single highly dimorphic species such as seen in Lufengpithecus. Liu et al. (2010) use a bevy of geometric morphometric techniques to tease apart shape discriminations to sort the Jianshi teeth relative to a variety of hominin samples. In a cursory comparison of the new Jianshi molars with homologous teeth in Schwartz et als study it appears that the sort of comparisons made by Liu et al. (2010) should also be done with non-hominin taxa from contiguous regions of East and Southeast Asia. Additionally, the Mohui and Chuifeng Cave sites in the Bubing Basin of southern Guangxi have produced an abundant early Pleistocene fauna with, respectively, 16 and 92 teeth assigned to Gigantopithecus blacki. Another set (n=17) of smaller teeth from Mohui have been tentatively assigned to Hominoidea (gen. et sp. indet. )(Wang et al. 2007). These are said to include molars similar to those from the Longgupo mandibular fragment (Huang et al., 1995). Wang et al. go on to say that this Mohui sample does not strongly resemble Pongo remains found in Wuyun Cave and other sites in China. In addition Chuifeng Cave has produced "24 relatively large teeth, with high crowned molars and a simple occlusal pattern, (that) differ from the low crowned and wrinkled molars of Pongo, as well as the very large teeth of G. blacki. These teeth are provisionally assigned to Hominoidea gen. et sp. indet." (Wang 2009) Unfortunately neither the Mohui nor Chuifeng specimens are figured in the pertinent articles. 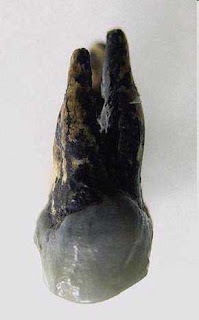 Another similar molar specimen has been reported from Sanhe Cave in Chongzuo, Guangxi (Jin et al. 2009). Given the fact that non-hominin, non-pongine teeth that have been mistaken for specimens of Homo are now found widespread throughout southern China and northern Vietnam, the possibility must be entertained that the Jianshi teeth also represent a non-hominin taxon. Zhao et al. (2009) describe and discuss a set of orangutan-like teeth from the early Late Pleistocene (~110 kya) site of Mulanshan, Guangxi. They review similar specimens collected from throughout southern China and from Chinese drugstores since the 1930s. They reach similar conclusions as have others, that there are two distinct morphs within the sample. 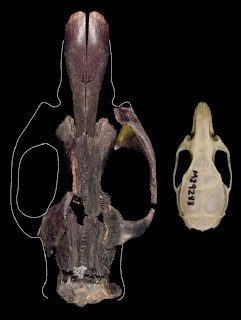 Specimens that are morphologically similar, but larger than, extant and subfossil orangutans from Indonesia (see also Wang et al. 2009) and those that are less crenulated with smoother, less complex occlusal surfaces. These latter specimens are said to be similar to Lufengpithecus but on average somewhat larger. Zhao et al. go on to say that there are also specimens within the Lufeng and Yuanmou hypodigms of Lufengpithecus that are similar to the more crenualted specimens collected from Pleistocene sites in southern China and northern Vietnam. They conclude that "In the absence of the skull and postcranial bones, it is difficult to establish new genus or species based on Pleistocene orangutan-like isolated teeth." Thus, there are a number of possibilities, none of which are, as of yet, conclusive. 1. All the specimens discussed above including the Jianshi molars are variants of one or more species or subspecies of orangutan. 2. The specimens can be divided between a Pleistocene descendant of Lufengpithecus, fossil forms of Pongo or a previously unidentified "mystery ape". 3. Some of the specimens can be allocated to an early form of hominin, the rest to Pongo or some other combination of the above. "Immediately adjacent to Tham Khuyen, this cave was excavated toward the end of 1964 by a joint Vietnamese-German (DDR) team. Dating is uncertain, but the site is thought to be approximately contemporaneous with Tham Khuyen. A single tooth was attributed to Homo erectus (Cuong (sic) Nguyen, 1985). This is a relatively large upper right molar (BL width 15.41 mm; MDlength 13.47 mm), which is heavily worn. It almost certainly belongs to the "Morph 2" category of Schwartz et al. (1994), described below as a new species of Pongo." (Schwartz et al. 1995). To the left is an upper right molar of Lufengpithecus hudienensis recovered from the Yuanmou Basin of Yunnan. The Yuanmou sites are dated between 7-8 mya. Note the similarity of the Yuanmou specimen's occlusal outline to the specimen of Homo erectus from Zhoukoudian (ZKD) shown below (specimens are not to scale). Right Lower M1 or M2 (TK 65/123), Right Lower M1 or M2 (Jianshi PA 1277), Longgupo Right Lower M1 (not to scale). Original Jianshi lower molars compared to Pongo lower molar from Tham Khuyen Cave Vietnam (center). Note median placement of longitudinal fissure and alignment of transverse fissures in all specimens (not to scale). Original Jianshi lower molars compared to Lufengpithecus hudienensis from Yuanmou Basin, Yunnan and a specimen from Mohui originally described as "hominid" (not to scale). 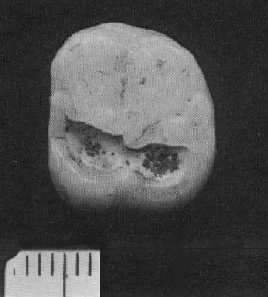 Given the ambiguous nature of hominoid dentitions from the Mio-Plio-Pleistocene of East Asia the issues discussed above cannot be resolved until more diagnostic material is recovered. Ciochon, R. The mystery ape of Pleistocene Asia. 2009, Nature, 459:910-911. Etler, DA. The Chinese Hominidae: New Finds, New Interpretations. 1994, PhD. Dissertation, University of California, Berkeley. Etler, DA. Mystery ape: other fossils suggest that it's no mystery at all. 2009, Nature 460:684. Etler, DA., Crummett, TL., Wolpoff, MH. Longgupo: Early Homo colonizer or Late Pliocene Lufengpithecus survivor in South China? 2001, Hum Evol. 16:1-12. Gao, J. Australopithecine teeth associated with Gigantopithecus. Vertebrata PalAsiatica, 1975, 13(2):81-88. Huang, W., Ciochon, R., Gu, Y., Larick, R., Fang, Q., Schwarcz, H., Yonge, C., de Vos, J. and Rink, W. Early Homo and associated artifacts from Asia. Nature, 1995, 378:275-78. Jin, C., Qin D., Pan W., Tang Z., Liu, J., Wang, Y., Deng C., Zhang, Y., Dong, W., and Tong, H. A newly discovered Gigantopithecus fauna from Sanhe Cave, Chongzuo, Guangxi, South China, Chinese Science Bulletin, 2009, 54(5):788-797. Liu W, Clarke R, Xing S. Geometric morphometric analysis of the early Pleistocene hominin teeth from Jianshi, Hubei Province, China. Sci China Earth Sci, 2010, 53: 1141–1152. Schwartz, J. H., Vu, T. L., Nguyen, L. C., Le, T. K., and Tattersall, I. A diverse hominoid fauna from the late middle Pleistocene breccia cave of Tham Khuyen, Socialist Republic of Vietnam, 1994, Anthropologica Papers of the American Museum of Natural History, 73:1-11. Schwartz, J. H., Vu, T. L., Nguyen, L. C., Le, T. K. A review of the Pleistocene hominoid fauna of the Socialist Republic of Vietnam (excluding Hylobatidae). Anthropological Papers of the American Museum of Natural History, 1995, 76:1-23. Wang, W. New discoveries of Gigantopithecus blacki teeth from Chuifeng Cave in the Bubing Basin, Guangxi, south China. Journal of Human Evolution, 2009, 57:229–240. Wang, W., Potts, R., Hou, Y., Chen, Y., Wu, H., Yuan B., and Huang, W. Early Pleistocene hominid teeth recovered in Mohui cave in Bubing Basin, Guangxi, South China, 2005, Chinese Science Bulletin, 50(23):2777—2782. Wang, CB., Zhao, L., Jin, C., Hu, Y. and Wang, CS. Quantitative study of Pleistocene fossil orangutan teeth from China and their taxonomic significance. 2009, Acta Anthropologica Sinica 28(2):192-200. Wang, W., Potts, R., Yuan, B., Huang, W., Cheng H., Edwards, R. L., Ditchfield, P. Sequence of mammalian fossils, including hominoid teeth, from the Bubing Basin caves, South China, 2007, Journal of Human Evolution 52:370-379. Zhao, L., Wang, C., Jin, C., Qin, D. and Pan, W. Fossil Orangutan-like hominoid teeth from late Pleistocene human site of Mulanshan cave in Chongzuo of Guangxi and implications on taxonomy and evolution of orangutan, 2009, Chinese Sci Bull, 54: 3924―3930. Zheng S H. Jianshi Hominid Site. Beijing: Science Press, 2004, 1–412. Zhou, G. Supplementary notes on the baby skull of Sivapithecus yunnanensis -- with discussions on "Wushan Man." Memoirs of Beijing Natural History Museum, 1999, 58:111-123. Back in June I posted a comment on the implications of the discovery of "Kadanuumuu (Big Man) and Karabo" the partial skeletons of Australopithecus afarensis at Woranso-Mille in Ethiopia and A. sediba from Malapa in South Africa. 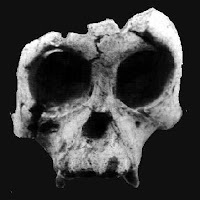 The point I was trying to make was that new discoveries at both ends of the Australopithecine lineage were blurring the distinction between the genera Australpithecus and Homo. The Homo-like features of the Woranso-Mille skeleton suggested that the time separating the primitive looking Ardipithecus ramidus from Woranso-Mille's ancestor A. anamensis was too short to accommodate the degree of morphological change that had occurred between them. On the other end of the timescale the recently described A. sediba has been attributed to early Homo by some because of the amount of morphological overlap (particularly dental) between the two. Now we have a new report in Nature by McPherron et al. that shows that A. afarenis was a potential stone tool user by ~3.4 mya. This further muddies the water regarding what it is that differentiates Australopithecus from Homo. The Woranso-Mille skeleton mitigates the role of body size and proportions in distinguishing the two from one another. A. sediba minimizes the differences in tooth size, form and function between the two. H. floresiensis, if accepted as a valid hominin species, demolishes the brain size Rubicon separating Australopithecus from Homo. And now we have the last bastion of Homo, stone tool use, falling by the wayside. What is left to distinguish the genus Australopithecus from Homo? As I previously argued the sinking of Australopithecus into Homo, as a subgenus, seems eminently reasonable, if not now mandatory. The oldest direct evidence of stone tool manufacture comes from Gona (Ethiopia) and dates to between 2.6 and 2.5 million years (Myr) ago1. At the nearby Bouri site several cut-marked bones also show stone tool use approximately 2.5 Myr ago2. Here we report stone-tool-inflicted marks on bones found during recent survey work in Dikika, Ethiopia, a research area close to Gona and Bouri. On the basis of low-power microscopic and environmental scanning electron microscope observations, these bones show unambiguous stone-tool cut marks for flesh removal and percussion marks for marrow access. 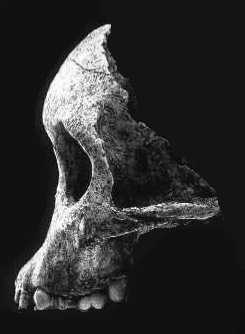 The bones derive from the Sidi Hakoma Member of the Hadar Formation. Established 40Ar–39Ar dates on the tuffs that bracket this member constrain the finds to between 3.42 and 3.24 Myrago, and stratigraphic scaling between these units and other geological evidence indicate that they are older than 3.39 Myr ago. Our discovery extends by approximately 800,000 years the antiquity of stone tools and of stone-tool-assisted consumption of ungulates by hominins; furthermore, this behaviour can now be attributed to Australopithecus afarensis. Either A. afarensis should be revised to H. afarensis or the possibility must be entertained that the Woranso-Mille individual and the maker of the stone tool cut marks at Dikika represent a new previously unknown species of Homo (perhaps H. antiquus Ferguson 1984) that lived contemporaneously with A. afarensis. Will the real “H. floresiensis” please stand-up? Well, I’m going to go off the deep end this time with what some may consider an outrageous proposal. Visions of giant rats dancing in my head have led me back to meditations on the enigmatic “hobbit.” Could the beloved “hobbit” aka “Homo floresiensis” actually be a descendant of Lufengpithecus? The edifice I will build is most likely a house of cards, but venues such as this allow for flights of fancy, if not fantasy. The discovery of a 7 million year old hominoid tooth in Bulgaria may not sound like much but it could be a “big deal.” For one, it demonstrates that late Miocene (Turolian) apes persisted in Europe much later than previously thought. 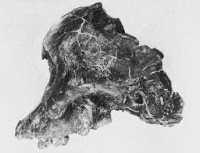 The Turkish ape, Ouranopithecus turkae, with a biochronological age of 8.7–7.4 mya and fossil hominoids from Yunnan attributed to Lufengpithecus, dated between 6-11 mya, also last well into the Turolian. It is also during the Turolian that purported basal hominans (i.e. 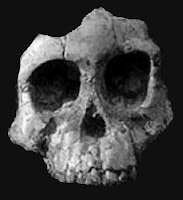 Sahelanthropus) begin to appear in the African fossil record. Well Sir Arthur Conan Doyle had it right. Even he may have been daunted by a recent discovery on the neighboring island of Timor. Imagine a fully grown raccoon weighing between 10-15 lbs. Now morph it into a rat of similar weight and size. What you have envisioned is a new species of rat that lived on the Indonesian island until it went extinct about 2000 years ago. As humans have lived on Timor since at least 40,000 ya there's no question that these giant rats graced the palate of many a Timoran. The largest rats alive today are found in the Philippines and weigh a mere 5 lbs at most. Read more about it at Science Daily. The Timor rat is to the left, the common black rat to the right. The Paleontological Museum in Assenovgrad, Bulgaria, a branch of the NMNH – Sofia recently announced the discovery of a Late Miocene (Turolian) hominoid in South Bulgaria (Chirpan District). The discovery, the first of its kind in Bulgaria, was the result of intensive paleontological field work that has led to the identification of a number of Late Miocene fossil localities. The recovery of over 30,000 fossils lays a firm foundation for the study of Miocene faunas and paleoenvironments in Bulgaria. Given Bulgaria’s proximity to Late Miocene hominoid discoveries in Greece and Turkey the search for fossil apes was given top priority. The new find consists of a single upper fourth premolar resembling Ouranopithecus. A preliminary report is given by the Bulgarian Science Academy. Of most significance is the specimen's age, estimated to be ~ 7 mya. This is later than any previously discovered European hominoid and coeval with Lufengpithecus from Yunnan in China. This suggests that Eurasian hominoids survived later and were more widespread than once thought. How this relates to the emergence of hominans is at present unknown. Here are side-by-side comparisons of the Butterfly Ridge Child (Lufengpithecus hudienensis)(YV0999)(7-8 mya) and the Dikika Child (Australopithecus afarensis)(3.3 mya)(above) and YV0999, the Taung Child (A. africanus)(~2.5 mya) and The Hadar juvenile (A. afarensis)(3.2 mya)(below). I've taken some liberties with the Dikika and Taung specimens by photographically removing the bone enmeshed in matrix and the endocast, respectively, to highlight the portions of the face that are comparable to the Yuanmou specimen. Interestingly all are about the same dental age. There are clearly some similarities here. Over the last month I've been reviewing the study of Lufengpithecus lufengensis recently published by Xu and Lu (2008). It is the 3rd publication in the ponderous sounding series of monographs entitled "State Key Project of the 9th Five Year Plan -- Origin of Early Humans and Environmental Background." The 2nd monograph in the series deals with a number of sites in the Yuanmou Basin of Yunnan that have produced prolific fossil hominoids. Long thought to be younger than Lufeng, these sites are now known to be somewhat older, between 7-8 mya. Lufeng has been dated perhaps a million years younger. The most important hominoid fossil excavated from the Yuanmou basin is a little heralded juvenile skull which is finally described in detail in the recent monograph (Qi and Dong 2004).